A newspaper editor tries to keep his star reporter, who also happens to be his ex-wife, from leaving the newspaper business and getting remarried in this version of the classic stage play The Front Page. The spin put on this telling of the tale, which otherwise remains true to the original storyline, places His Girl Friday more into the screwball comedy genre that was in its heyday in the '30s and '40s. It also gives its leads, Cary Grant and Rosalind Russell, plenty of opportunity for witty repartee tinged with just the right amount of sexual tension, all in the service of a delightful script that never once tries the audience's patience. So why should modern audiences watch such an old film? One big reason is to view an excellent example of the lost art of the screwball comedy. Though His Girl Friday is a bit more tame in its antics than some entries in the genre, it's still packed with enough sight gags, mix-ups and people working at cross purposes to ably take its place beside such stalwarts of the genre as Bringing up Baby and Nothing Sacred. Watching all the intricate action woven together into a neat pattern is astonishing. Then there's Cary Grant. Many who are only familiar with Grant from his later films or his collaborations with Alfred Hitchcock are not aware that he catapulted to stardom as a comic actor, and a very gifted one at that. It was rare in Hollywood for one whose looks so obviously destined him for leading-man roles to be afforded the opportunity to do comedies, but his comedy timing was recognized early in his career, and his natural athleticism enhanced his capabilities for the screwball. The combination of suave good looks, sophistication and pratfalls made Grant a favorite of the genre, and helped establish his star quality in a manner that might not have happened had he remained on the more traditional leading man track. Not to mention the fact that Cary Grant at 36 was even more impossibly handsome than Cary Grant at 56. His Girl Friday is also surprisingly relevant for a film more than six decades old. Although it is played as a comedy, its underlying commentary on the depths to which journalists sometimes sink to get a story is quite topical in this day of 24-hour news channels that forget the second half of the old adage "get it first". In a world where reporters from prestige newspapers have admitted to creating articles from whole cloth, the spectre of newspapermen in a courthouse press room making up stories on the barest of facts and a lot of supposition doesn't seem all that far-fetched. Nor is the sight of a mayor so desperate to be re-elected that he would suppress the existence of a reprieve and send an innocent man to the gallows at all surprising in a world of corporate malfeasance and electoral scandal. 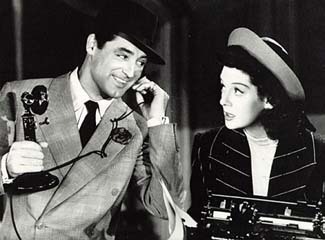 But the best reasons to watch His Girl Friday are the sparkling dialogue and wonderful acting. It's like an hour-and-a-half spent in the best of company.